Apologies for not updating last Friday but there was not a lot to report and anyway the main event took place on Tuesday 22nd. It was Christmas Party time which means we get the test track out. Well, here's a collection of expressions. We had quite a few visitors as well. And being party time we had a few drinks. Paul S on the left is due for a new heart valve in the next month or so. Paul W on the right is explaining the technique. 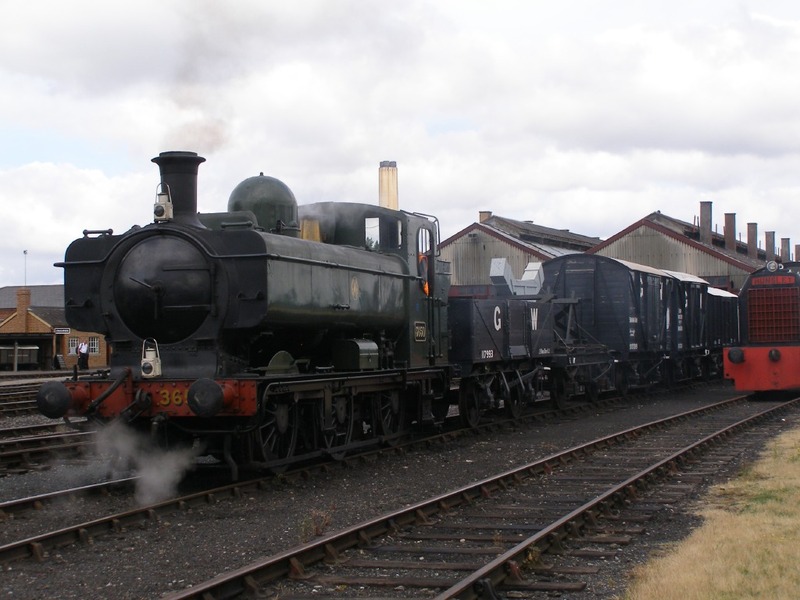 We had a few visiting locos too, here are some from Fred Lewis. Al brought a few as well but the Britannia caught the eye again. 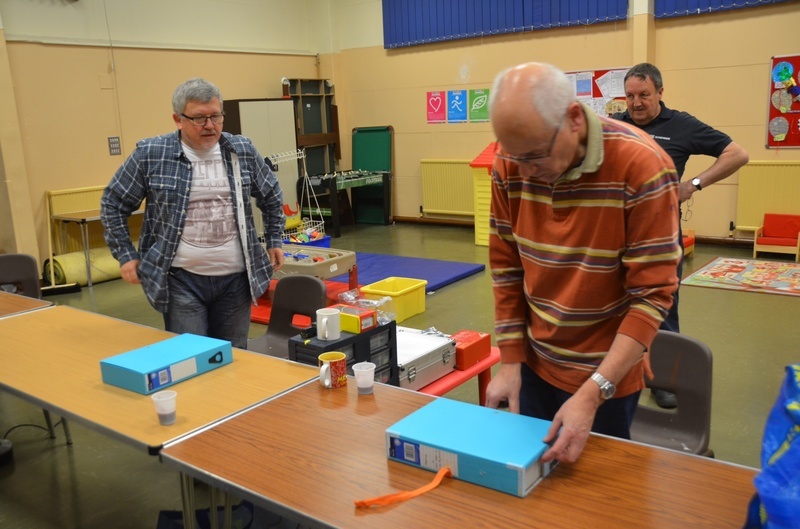 Steve N gave his cranes a run out to the approval of Steffan who'd built them. And its hardly surprising after releases from Dapol, Minerva and Ixion that there were a feew small engines on show. So Tuesday was the big day, the day we erected LMJ to try to complete the full circuit. We had to fit in the last baseboard to finish off, but as the last three boards we made had wandered away from their planned dimensions (have you ever tried to make curved baseboards?) then we didn't know the exact size of the final board6 until we had the rest erected. 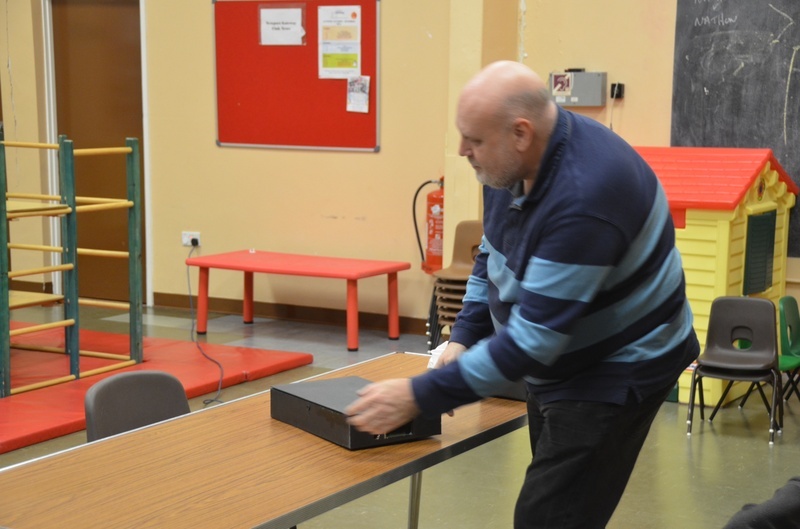 With plenty of willing hands - a big thank you to all who turned up - this part of the process was completed in under an hour. I apologise for not taking any photos, I'll see if there are any available elsewhere. Here's a shot of that final baseboard6 in the workroom on the Friday after. The odd pieces of wood in the centre of the board are bracing it and holding it in shape. We couldn't complete it as close inspection of the leftmost beam will show a shortfall in length. The dimensions had wandered far more than we anticipated and our carefully prepared beam was far too short. Fortunately the other beam was long enough. 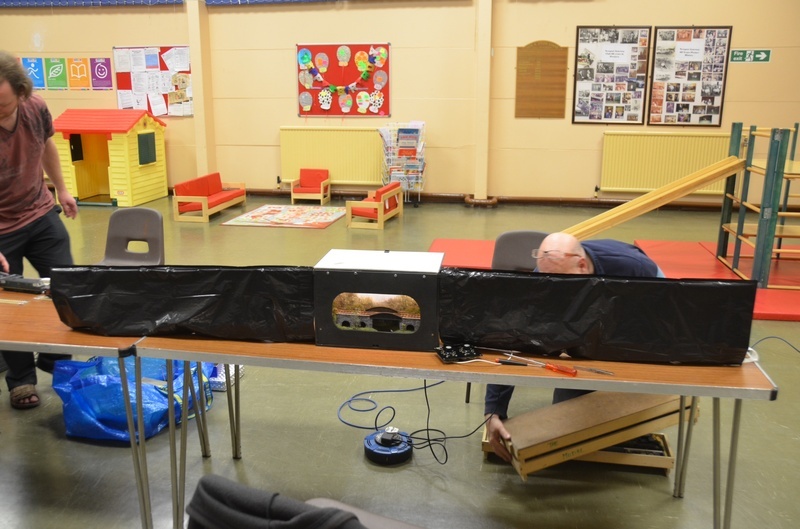 By the end of Friday's session the new beam was complete with the glue drying. On Tuesday there was a hiatus in activity whilst there was a certain amount of headscratching going on. The scenic team therefore pressed on with more terraforming by the Squirtyfoam Method as seen below. The gap is for the underbridge that led up to the brickworks. Those not scratching heads or squirting foam consumed tea and mincepies. Its beginning to look a lot like Christmas . .
And here's an early Christmas present for Rob - its the new Peckett from Minerva Models. Keeping with 7mm scale here's progress on my 42xx, though the smokebox/boiler is still a work in progress and there's a lot of filing to do on the firebox. Meanwhile on LMJ there's scenic work with a base layer of ground colour going down. Firstly, from earlier in the week, here we have the 2car Thumper set or Hampshire Unit that Al has been working on for Paul. Both coaches are now on their bogies with the motor and gearbox in the rightmost car. Preparatory work has started on board 6, the last of the LMJ boards. This one is really a part of the fiddle yard so has straight sides and a full flat top. It should be easier to construct. Here's a prepared girder, with a substantial block in the end ready to cut to the correct angle. For many months I have been building a set of three turnouts for LMJ. The work has had to fit in with other activities and shows, so progress has been slow. But the point blades are in and it looks good, flowing nicely. The real test will be when we reverse a 30 wagon freight train through it. So next it'll be fit the checkrails, then all the inside chairs followed by a good cleanup. To begin with Tuesday, Occasional Albyn visited and kept up his winning run by bearing gifts. Moving on to Friday and we did a lot of reorganising and shifting of boards to get a good run of LMJ in position in the layout room. Here's the result. Counting away from you there are boards 13, 12, 11 and 10. Board 13 is the key board as it has the junction for the Usk branch. This includes 14 and 15, Board 15 having featured in recent postings. The 5 fiddle yard boards are neatly out of the way in the workroom. At the weekend Pavilion End went to the model show in the centre of Thornbury. Here are the layout boards packed in the trust Octavia. The rest of the kit went in a second car. And erected in the rather quirky venue - lots of smallish rooms both up and down stairs. Luckily we were downstairs. You won't see this view unless you get right around the back. And suddenly there's lots happening. So to begin at the beginning, here's what happened Tuesday. Steve Neill brought along his latest toy, this time its the black variety. Also bearing a 7mm loco was Steve Bell, with this old representation of a Brecon and Merthyr 2-4-0T. He immediately had LBH's interest! The chassis could do with an upgrade but it was declared a fair representation of the real thing. There have been mutterings about a further 7mm layout based around Merthyr, inspired by the book "Six Railways to Merthyr" and this is an obvious candidate. Dropping a long way down the scales, Mike Edmunds brought along this yard building for his 2mm American layout. The picture in the background is the prototype and that's a 20p piece. Having completed baseboard8 last Friday, we thought it would be useful to try it mated to baseboard 9. BBoard 8 is the further one. We are pretty happy with the join here. The trackbed has yet to be put in place of course. We decide to fix one end of the other end cheek ready for bending into shape next session. We have already marked out the position of the two ends, when curved, by the masking tape on the floor. Of course, all this work requires sustenance and Mrs Bell provided some apple and almond sponge cake which, as you can see, was very popular. I'm afraid the other contribution (M and S extremely chocolatey biscuits from Paul) will have to wait for next time. While some of us were doing cut, staple, hammer, glue, screw, others were building things. WagonslashCoachMan continued working on Paul's Hampshire Unit or Thumper. There were loads of door hinges and door bumpers to apply. Having finished those it was on to the roof detailing which consumed all the available split pins for fixing. And finally, Rob Foot brough along his brand new, never been out of the packet Bachmann Hawkesworth Autotrailer and 64xx pannier tank. As has been said before, the quality of models today is exceptional. Rob did take the time (quite a bit, actually) to remove the standard couplings and fit scale ones and pipework before the shots were taken. Next weekend we are taking Pavilion End to the Thornbury Show which is in the village itself, not the Leisure Centre, so an update may be delayed. Before explaining the weird structure from yesterday, here's the conclusion to last week. The Frecclesham boards were lifted into place on the new supports, though with some bad language as there is no clearance at all at either end. The supports showed minimal deflection. We didn't try to get the backscene into place so its not looking at its best. It helps with the puzzle from Thursday if you know that board 8 is intended to be curved. You can see the two different lengths below. The diagonals are temporary, holding the curved shape which took a lot of effort and more swearing to achieve. The outer skin of the longer beam helps set the curvature and the proper longitudinals are now fixed. With final cross-pieces screwed and glued we left it to set. Of course, this makes the rash assumption that the floor is actually flat. Er chaps, is it meant to look like this? There was an overdue visit from Richard Price this Friday. He came to show us his latest acquisition, a Heljan GUV. Like all of these modern models, its really good. Look at the detail here. And his own project is progressing. This one is from the JustLikeTheRealThing stable and is a Class 40. Although the instructions are a bit vague on the cab detailing so progress has been limited. The size and number of baseboards for LMJ has been a concern for a while. So we have started to reorganise and make space, starting in the end of the workroom. Some of the support beams used on Hazelhurst have been utilised to eventually hold up the Frecclesham baseboards. Here's the outer one being located against the end wall. The weight is take down to the floor by the upright, not by the wall which is plasterboard. So, a quick check for level and unbelievably, its spot on - you'd think we actually knew what we were doing! A bit of an action shot, removing a protruding screw. Note that the rear beam is now in place. At this point we realised that the height was perfect for alternative usage. More work on LMJ boards here. The superelevation shows up well here. And we found a weird octopus/got as far as putting in droppers for the wiring. Previously I forgot to include this artifact found on Sheffield Park station. Here's a nice shot from the end of the day. Its a Class H if you know your Southern locos. Pity about the HV vest though. On the Saturday we tested and ran the layout to our ususal, hopefully high, standard. Here we are in action. At the end of the show we quickly had to find a pub showing the rugby. Of course, the nearest was 'The Station'. In the evening our hosts, the Uckfield club, put on a meal and quiz. Nice venue and good food and with some local help we won the quiz. It helped we had 8 in our team. Here are the scores and the winnings. This weekend we took Frecclesham to East Sussex. 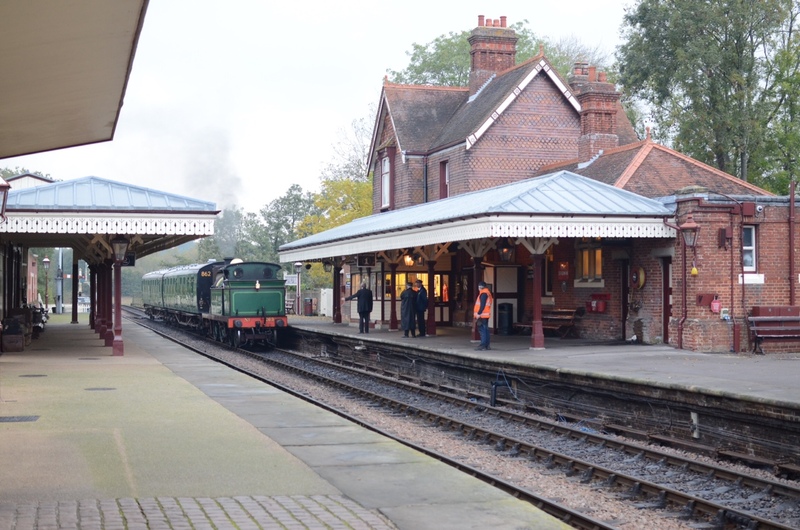 With an early start we were able to make the Bluebell Railway in time for the last Autumn Tints special of the day which does the round trip in an observation car. A charming little engine and nicely restored LNWR coach. To start from Sheffield Park it needed a run round. And then we were away. Its a very good preserved railway with lovely signalling (they use proper operating distants, no just fixed ones) and a good atmosphere. The volunteers were very friendly and chatty and the driver even slowed down so you could view the wildlife. As you can see, there were not a great many trees in full autumn splendour. There were loads more photos taken and some more will be added soon. I'd never visited the Bluebell before, but will have to go again soon. 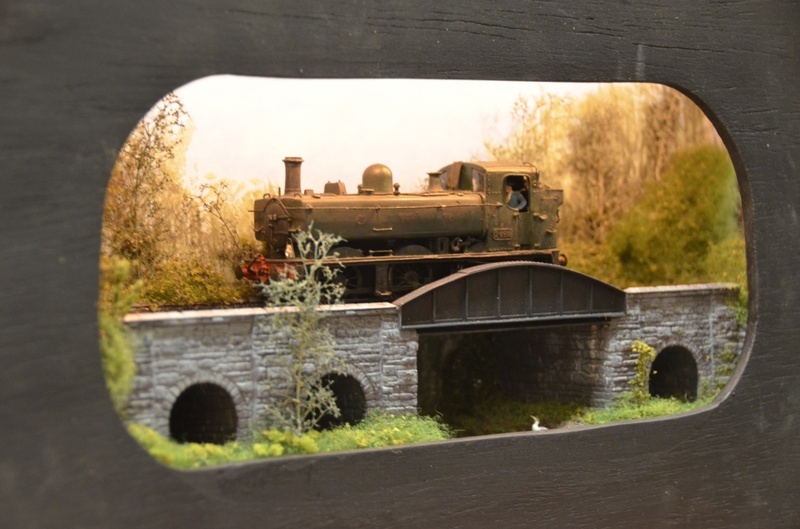 Next weekend we are taking Frecclesham to the Uckfield Model Show. Its the first time we've been there. As is usual the week before a show, we spent the time checking box contentsassmbling bits and pieces and putting the transport ends around the layout. Not very exciting or photogenic. There probably won't be anyone at the club next Friday. A busy evening in terms of lots of things happening, but perhaps not much modelling done. Wehad a visit from long long ago member Trveor Williams, back in the days of Over Wellmyn and Beechwood Park. (1980s) He very kindly had some surplus modelling bits and pieces that he donated to the club. Thank you Trevor and you are most welcome to call again. Amid all this Al produced one of those 7mm Heljan little green railbuses. And I forgot to take a picture but can report it looked very good and ran smoothly. Also in the forgetful box are these delights from France brought back by Steve Bell. We'll have to open them next week. I carried on with the real track for baseboards 16 and 15 on LMJ whilst Steve Bell cut out 'chads' from the trackplan of baseboard 15 ready to mark up the alignment. Here's the result. You can see there is a bit of a misalignment on the outer track. This is due to not finding the printed plan for the nearer board and so we cut folwef the curve of the trackbed. This is easily recoverable over a couple of feet. So here is Steve's Dapol terrier now fitted with decoder and on Frecclesham for a test run. As our pointwork is built to the finer 31.5 mm gauge standard there's no guarantee of smooth operation. And this is how it turned out as the dear little thing was lumpy on the tighter turnouts. Some back-to-back dimension checking is called for. So what are those coaches in the background? Making a special guest appearance we have a well-known star. It had been unearthed from a deeply hidden box so was also being tested. Did it pass? Does it matter? By way of apology we had these cakes from Steve. Meanwhile on LMJ the first piece of real track has been laid. This is on the transition from the fiddle yard to the scenic front. We applied PVA glue, checked alignment, applied ballast, then weighted down. In this shot, to the left, the excess ballast has been vacuumed off. To the right is the full ballast layer as applied. The blobs were the result of an attempt at a dampening spray of water, before more PVA.That spray bottle is now in the bin. Apologies for raising your expectations, but it seems no significant purchases were made at the Telford Show. Work continues on LMJ track and Frecclesham stuff. Here's the improved valancing on the station building. Steve (XYS) arrived this evening with his new toy. Yes, its the Terrier from Dapol. It looks brilliant, there's lots of fine detail and excellent work on the livery. It runs well too, though not chipped yet. In fact he's so impressed that another one, in BR livery this time, is likely to be ordered. And at £169 its an absolute bargain! They were very small engines though. Compare its size to the van. With the Telford Gauge O show in progress this weekend prepare for more new purchases next week. After last week's very full attendance, this Friday featured just two attendees. Well, really only one and a half as Paul had to go to work at 9:00. Nevertheless, we still completed our task which was fitting end protectors to the fiddle yard boards of LMJ. This is only one out of the ten fitted, using captive T-nuts in the baseboard ends to receive standard bolts. It would have been nice to have a photo of more of them but they are inconveniently stacked three high under the very end of the racking system. As it was we barely had enough room, after sliding them along, to get in with a power drill, hammer and screwdriver. And then sliding them back. 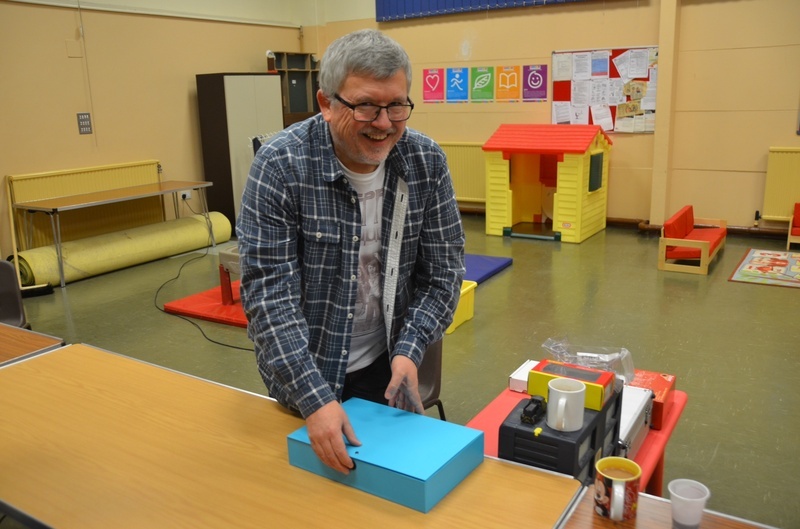 A well attended session this evening including our occasional visitor Albyn, here to collect a kit and some bits, do a bit for LMJ, and most importantly bring along a cake. Coffee this time. Steve Bell brought some Festinioig wagons to work on, but got roped into more wheel cleaning for Frecclesham. Rob carried on with the roof for the station building with some nice cast brass chimney pots. And there was more LMJ trackwork in progress. One of the less good features of Frecclesham was the alignment of track in the fidddle yard. The bearings on the drawer runners we used have worn, or the runners moved, so that a step is apparrent on some of the roads. So to help lift the traversing bit into line we've beefed up the locators with two of the chunky parts. It's improved the alignment. The station building on Frecclesham was always a 'mock-up', though a very good one. Rob has decided to make some improvements. You can see in the shot below that the chimney to the rear has no actual brickwork though the colour was convincing enough for many people. In fact it's been photographed many times. So there's a trial fit of brick on the front one and there should be some chimney pots soon. Steve B is busy cleaning the wheels on the rolling stock following the show. There's no dirt showing on the cotton bud as this is a posed shot after the cleaning had been done. Earlier there was plenty of dirt removed. Time to report back on our trip to Wells. The show takes place in the Town Hall, which is an old building on the picturesque Town Square. 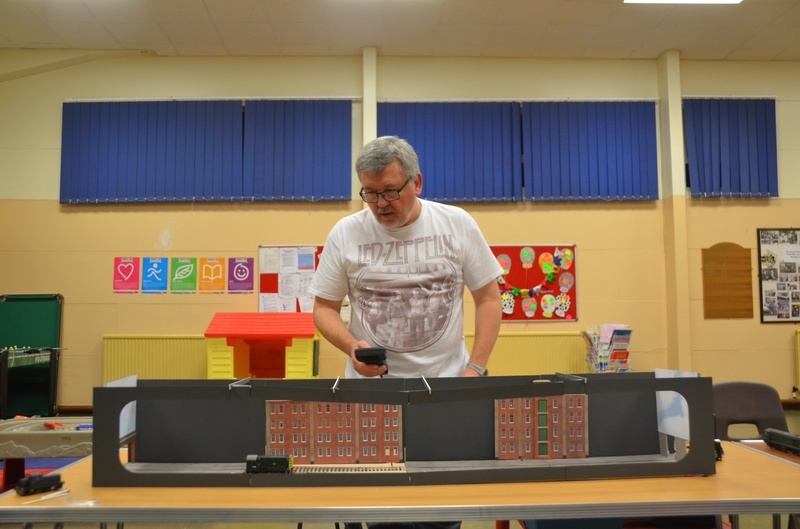 It's not the best of venues for a model show as it is lots of smallish rooms on different levels. But it's always a quality show. However, we were on the top floor and had to get 7 foot long baseboards up stairs that had either lots of turns or doors in the way. We struggled a bit, but got the three boards up there. 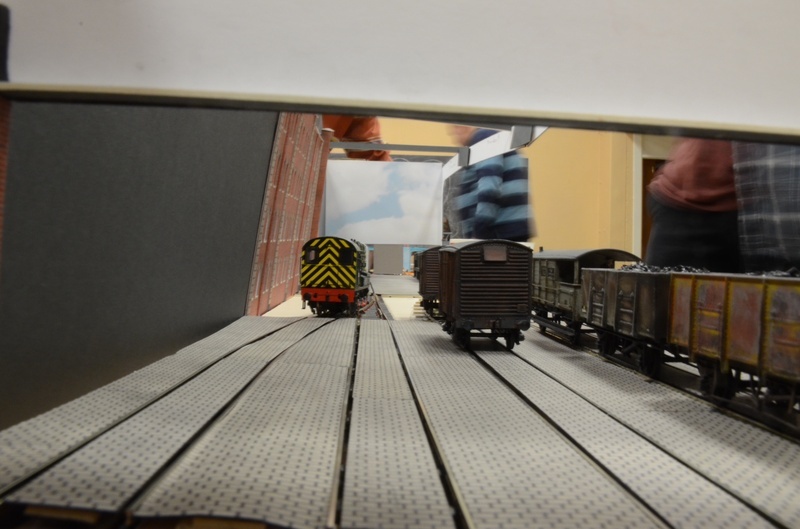 For this show we changed the stock slightly in that we did not have a pure goods train, but rather ran a mixed train. This consisted of a single brake second coach followed by wagons and a brake van. In the shot below it has arrived and been dealt with. The coach and loco are waiting in the bay to make the return trip and the freight stock shunted into the goods yard. The van will be returned as tail traffic, and later a freight engine might pick up the wagon and brake van. Saturday was very sunny and it streamed in through an upper window casting shadows on the layout. This gave the interesting effects seen below. Of course, a meal out on Saturday night allowed us to celebrate a successful day where we were please to again receive plenty of compliments. Rob is just polishing off his steak, which came with onion rings. This prompted someone else to have a side order of onion rings and when we were served for some reason we had an extra portion again. Nice as they were, they were huge and we could not manage to finish them all. The remains are bottom left in the pic below. We are getting better at taking the layout down and had the van packed 1hour 10 mins after the close of the show, including time out for the ritual round of Cold Tea..
With the new series of The Great British Bake-Off on the horizon I thought we'd better keep with the cake theme. So here is this week's contribution to our waistlines. Ok, there was no clotted cream, but still very enjoyable. The main activity of the night was making preparations for next weekend's exhibition at Railwells where Frecclesham has a starring role. That's not us being big-headed, it's just that at least 5 different pictures of Frecclesham have appeared in various media advertising the show over the last month. So with it packed and ready to go, the last essential for a good weekend was placed on the layout. So as we are away there may not be a report next weekend. With it being the holiday season, this Friday was a bit quiet. So to entertain you here are some more photos from our visit to Didcot, courtesy of Rob Foot. Its good to see freight running as well as passenger. Look at these tight clearances on the real thing. We modellers have a hard time reproducing this. Can this be a record . . . two updates within three days? Thanks to Mrs Steve Bell for these excellent dark chocolate chip and macadamia nut cookies. They all went by the end of the evening. We sweatily performed a lot of moving around of baseboards so that tracklaying can progress further. Here's where we were at the start of the evening. Once we had them separated, we could check the superelevation. Then we cleared a lot of junk from under the boards, removed the completed one and brought in the next in sequence. Viewed from the corner the newer board is nearest the camera. 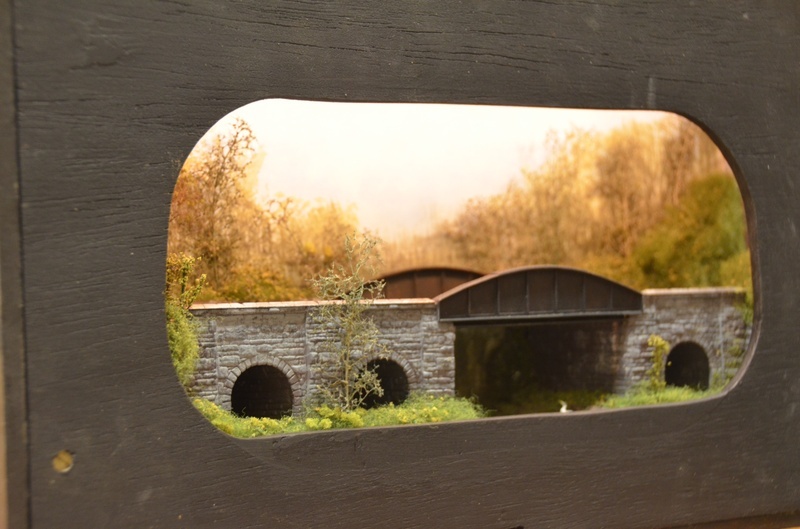 This is the first fully scenic board and is where on the real thing the Usk road goes under the railway. Fred is on the fourth round of tea, but I'm not sure he had a biscuit this time. Amid all the chaos Mike Edmunds progressed with his Wickham Trolley. Here's the chassis, which did move with a 3v battery attached to the wires, though it's very lightweight. It's quite small. Some of the superstructure (shed) parts are ready. As is the runner wagon. Yes, I know, it's been a month without an update! I've been away with American visitors showing them the delights of the country and eating and drinking too much. It's a hard job, but . . .
With it being the start of the holiday season activity has slowed down, but there should be enough to provide a progress report this Friday. 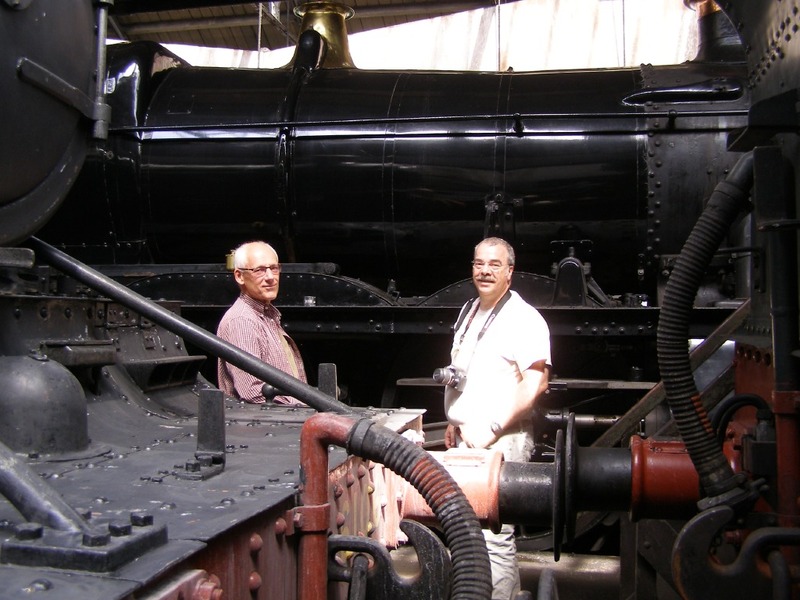 In the meantime here are some pics from our small delegation that visited the Didcot Railway Centre last weekend, followed by Ian Penberth's developing P4 layout of Bodmin Road. This is probably a bigger task than LMJ given that he's doing this by himself. We were excited about our visit, as the website said the Railmotor and newly restored Large Prairie would be in steam. Here's the railmotor looking spledid but raising questions about what the actual colour was like. And the photo doesn't help because that's not a true reflection of what we saw. And here it is in action, returning to the halt. We took a round trip of course. The Prairie was not in steam, however, but still looked good. Here's how the real thing deals with livery change. You can see the painted out GWR, just like modellers do. 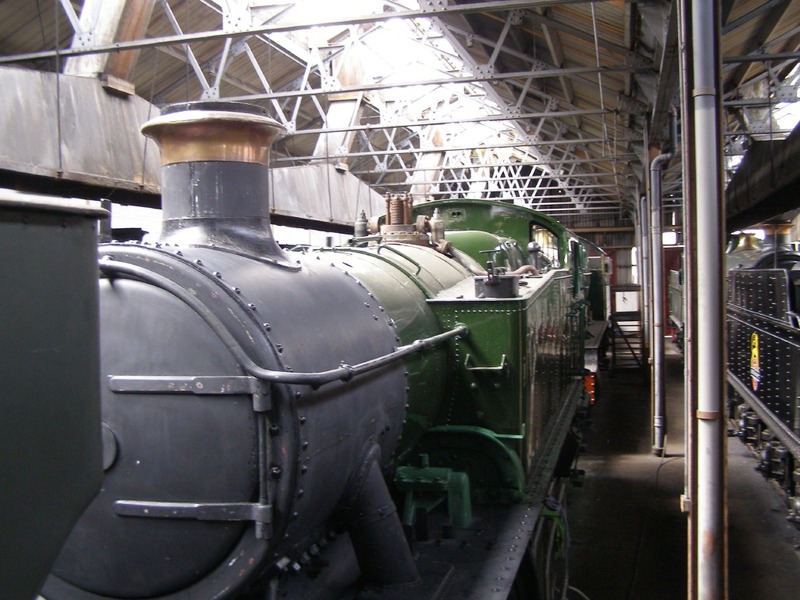 The Saint was rather hidden at the back of the loco workshops and no info on progress was apparent. And there was plenty of atmosphere. and very reliable running. The single slip below is probably the most challenging section but was negotiated faultlessly. The stock stayed the same six standard Bachmann Mk1s and there were three different diesel locos, but there was not a single derailment in about an hours running. Very impressive and thank you Ian for the invitation to visit. Following on from last week here's the rest of the tracklaying on LMJ. As before, it took a bit of adjustment later on, to get a nice smooth curve through this section. Meanwhile Wagonman continues to work on a bewildering range of kits. Apart from it being a six-wheeler, I've lost track of what this is. I'm on more certain ground here, having ridden in these (or rather, been rattled by). This is the body of a Hampshire unit, owned and started by Paul Sheward, now utilising Al's expertise with coaches. The task Friday was to fit the door stops to the sides. As Mike Edmunds seldom makes a Friday he doesn't often figure on these pages. So here's a shot from last Tuesday, when he regularly attends. His deep concentration is focussed on a tiny etch for a platelayers wagon to go with a Wickham trolley. (A sort of motorised shed on wheels for transporting gangers and their kit) Both these vehicles have tiny wheels and little weight but the plan, or rather challenge, is to motorise the Wickham. Mike already has a motor and gearbox. It's about the diameter of one of those pencils you used to have in diaries given to you at Christmas. Last week the term 'riffling' was introduced. Here's a kit from a much earlier riffling session by Wagonman. He got it from a Bring and Buy or Executor sale some time ago. Come Friday the seat used by Mike is occupied by Rob. 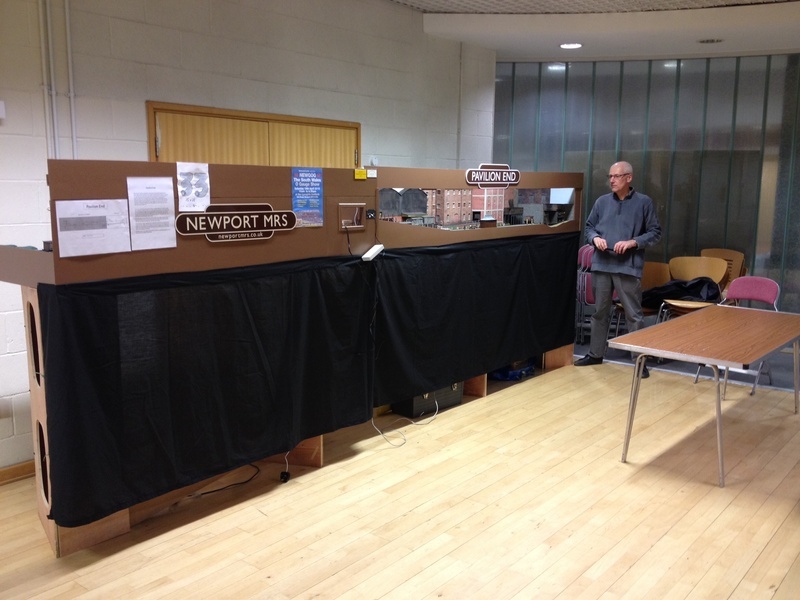 (Not exactly 'hot-desking' as its had three days to cool down) His current task is a Coopercraft GWR 3 plank wagon. Still with 7mm scale stock, Steve N has produced this Southern Brake Third from an Ian Kirk kit. The plan is to add an extra train on Frecclesham using this coach. It will come in as a mixed train as seen below. This will take the place of a regular freight train and the coach can then perhaps be taken out on the rear of a Pull-Push, adding some operational interest. 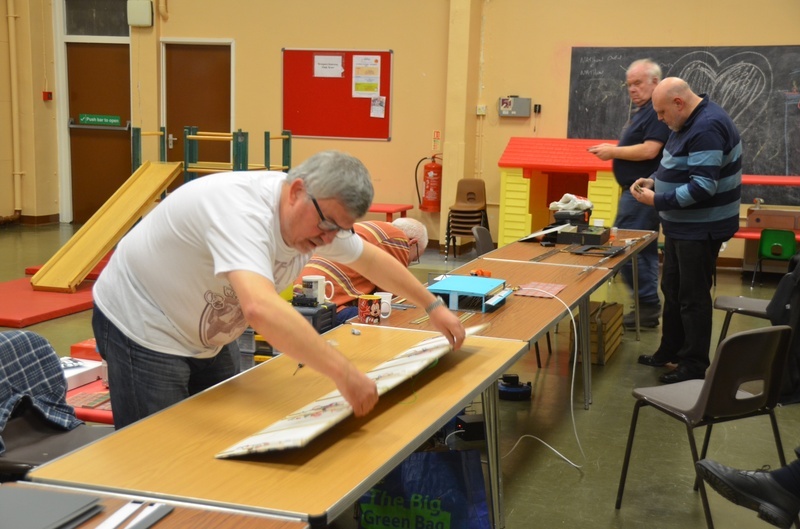 It was a busy evening with work also being done in the layout room, where the frame supporting the layouts has been shortened to provide a bit of workspace. With lots of LMJ baseboards being stored, see below, and four layouts at the clubroom, space has become a premium. Driver Lewis continues to work on the legs for the test track. This set have a nice secure chain between the two sets of legs. And more are in progress. Finally to some 4mm modelling. After a break of about two years whilst the baseboards were being constructed, some track has been laid on LMJ. It is being extended from the fiddle yard onto board 17. The inner track in place, with the outer just laid. The alignment was adjusted after the photo was taken as you can see it's not a smooth curve. Then it's on around Board 17 onto 16 and then the scenic front. This 45xx by Mike G has featured before. Its had a few updates and corrections and is ready for the paintshop. Grey etched primer will be first. Note that the lifting rings are actually able to lift and there are oil feed lines running from the lubricator. Meanwhile a bit of "riffling" is going on. 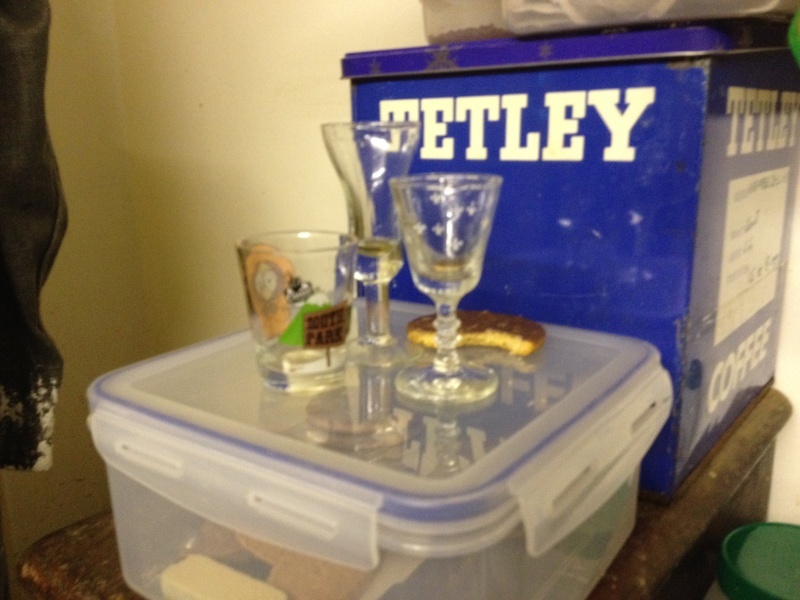 Steve has brought along a box of (some very) oddments that he is disposing of. 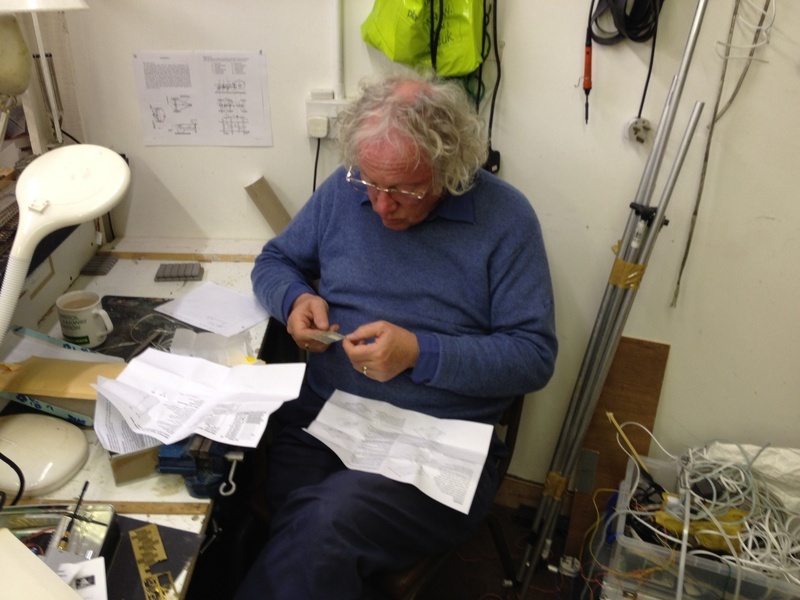 Alastair, having found some juicy MSWJ parts previously, is having another rummage or rather riffle through. 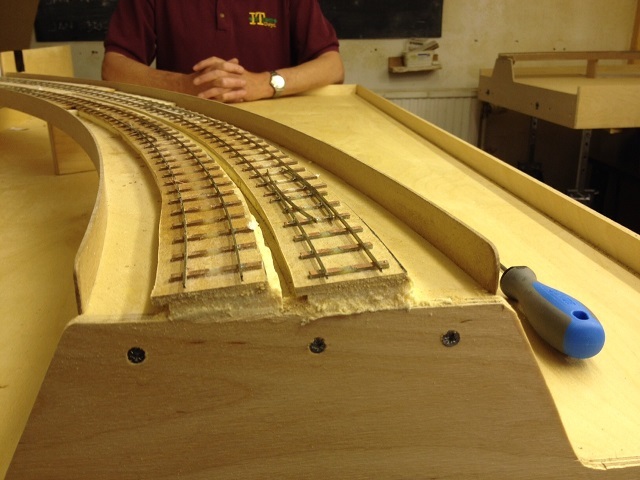 On the LMJ front we have erected the first fiddle yard board next to its curved section. We need to sort out the discrepancy in height between the two. In the end the solution was to cut 40mm off the bottom of the fiddleyard legs having repositioned the adjustable feet. We'll need to similarly treat the other boards later. 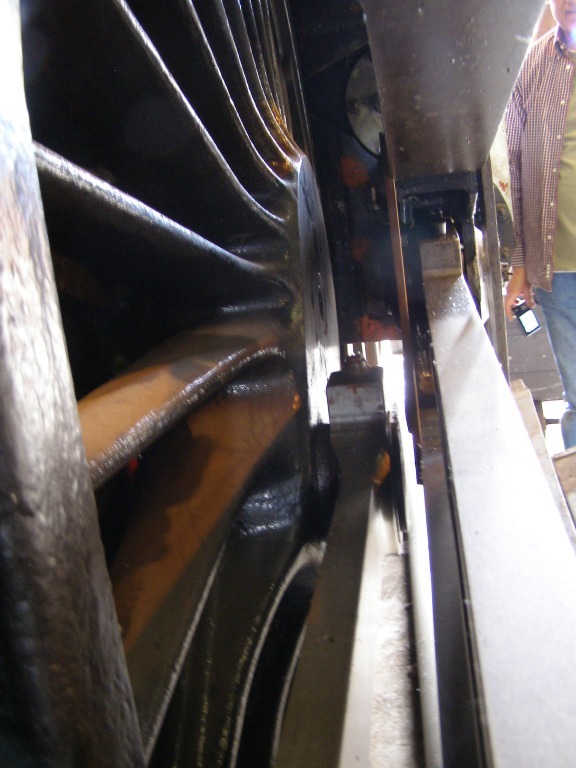 Below is a shot looking from the curved board onto the fiddle yard which ends at the copperclad strips. There is still a height difference but this will disappear when the 3mm MDF is laid ontop of the pale yellow foam. Here's a piece of 3 mm ply in place checking the levels. Looking out onto the curved boards of the Hereford end, the foam is taking up its superelevation starting from the pair of strips. And in the background and unrecorded small improvements to Frecclesham have been taking place. 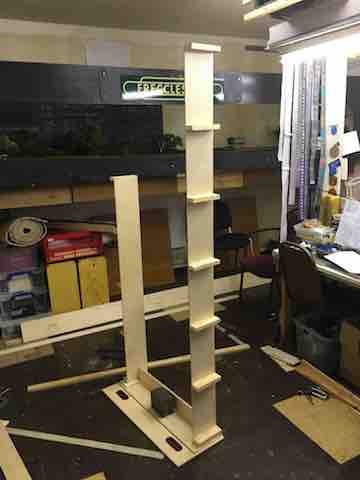 These include fixing points for the wooden transporting ends and having the boards repositioned so the we can operate it for testing and training purposes. The main task, however, is getting better rail alignment and reliability at the fiddle yard traverser to fixed board interface. So trains don't bump about coming out of the yard. With our trip to RailEx behind us now its time to do a short report. In preparation for the event Steffan put in a big push to finish off these two cranes that were commisioned by Steve (XYS). They are something special, and gained lots of favourable comments at the show. We put out a different one each day, as two together were a bit dominant. Of course, a few people pointed out that we needed the other vehicles to go with them. Personally, I'd never been to RailEx before and on this first visit I was impressed with the standard of the exhibits. But I have to say Frecclesham was not outclassed and we received lots of favourable comments. 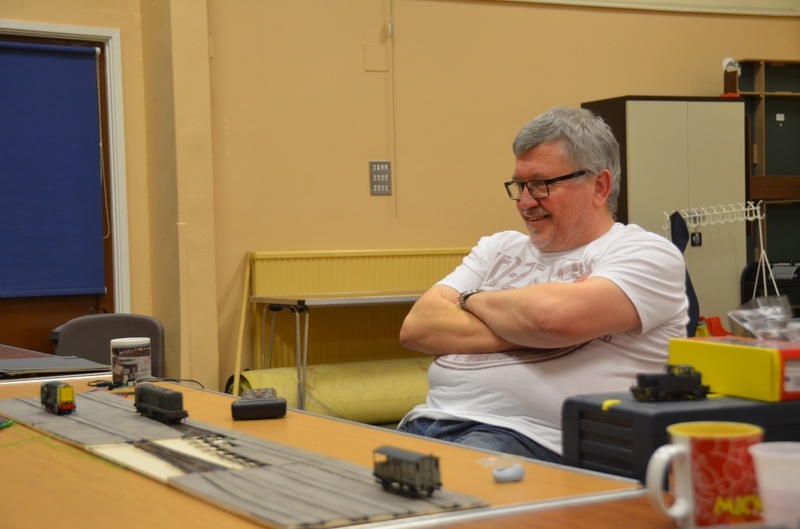 Also, Steve recorded a personal first - for the first time at a show he spent no time at all underneath the layout fixing electrical faults. If you are in the area looking for a place to eat, we can recommend The Seven Stars at Dinton. On the subject of eating, those who were absent last Friday missed these treats brought along by Rob. With the trip to RailEx at Aylesbury scheduled for next weekend, XYS has painted the P class which featured a couple of months ago. Its due for some weathering now and a crew. Not featured on the trip to RailEx is this 4 wheeler recently finished by Wagonman. And in the smaller scale Mike G has been working for a while on this 45xx from a Malcolm Mitchell kit. Its due for its primer soon. Next week may be short of a report as we are away at the Aylesbury show. This SR 700 class, the work of XYS, has been around for quite a while and is now finished. Except its too clean, so its off to Fred Lewis for a bit of weathering. There should be some 'after' photos before too long. We use servos for driving points and signals and these have to be driven by electronic circuits. They are not perfect and the servos do hunt to and fro about the end of their travel. This makes them 'chatter' which can be annoying. The new circuit board below is designed to eliminate this effect. It'll have a test soon when Frecclesham goes to RailEx in Aylesbury. Progress with the turnouts I'm working on is recorded below. This is a 1:10 crossing reading for a bit of tidying up. Work on the legs for the test track is necessary to prevent further failures. Improvements to the fixing of the legs is called for so here's the first set with some firm gluing and screwing. Well, not a lot special happened last Friday it was more of the same with trackbuilding and some work on Frecclesham. No pics either but there might be some later in this Tuesday supplement. More trackbuilding. These are of Rod's cross-over, which is more advanced than mine. You may remember that back in March we experimented with LED lighting. Well we have implemented it for Frecclesham. Here's a pic looking upwards towards the support batten with two tapes of LEDs underneath (one bluish, one warmish) plus reflective material to help. These will also be used as extra light for Pavilion End. Quiet night with a brace of Mike's and LBH. Nothing to note apart from Mike E's enchanting yoghurt recipe. Otherwise we got on with track building for LMJ. No pics, sorry. Nothing special to report this Friday, just preparation of Pavilion End ready for the NEWGOG show at Lysaghts Institute next Saturday and more pointwork for LMJ. Well, perhaps the star event is this offering from Steve B. This is a surprise. These are not the work of Wagonman! The one on the left is from the LBSC railway, N Erly vehicle and one of the wagons for the proposed 1883 scenario on Frecclesham. Note the crude brake system on one side only. On the right is a Banana van from a Parkside Dundas kit. And the boy hasn't stopped there. Below is a Southern P class. A characterful little engine. An evening for doing some shifting around. As we now have all except for three of the boards for LMJ in the clubrooms, space has become a bit of an issue. 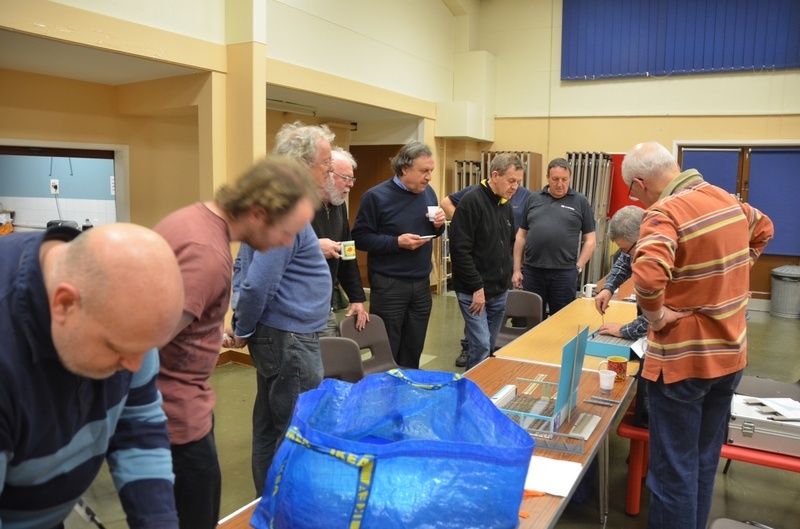 We also need to have Pavilion End erected so we can practise and test it as well as preparing Frecclesham for Railex in May. And we want to lay more track on LMJ. With a little shifting around there is now this space for Pavilion End. The infamous, awkward "trouser board" is stacked at the end. For the lighting on LMJ we're looking for a lightweight LED source. These strips of 12v LEDs were on trial this evening. They come with a 'self-adhesive' backing strip. Connect to a power supply and the give a good glow. 'self-adhesive' wasn't so they ended up like this on the floor. However, the brightness was good and a second strip would provide enough lumens though a different colour LED might provide a better balance. So trying now to push on with LMJ work, LazyBonesHall has taken on this crossing which has the diversion down the branch at the top of the picture. And I also have a crossing to do, which is the exit onto the mainline from the headshunt. Rob Foot has had his 7mm Ixion tank for a while now, but he has finally weathered it. Worth the wait, I think. We spent a little while experimenting with using commercial gazebos as a means of facilitating the lighting of LMJ. The idea is that the roof of the gazebo will eliminate unwanted ambient lighting and provide a support for lightweight LED lighting systems. A fair bit of development is still required but the initial trials looked promising. LMJ, Cwm Du and Frecclesham erected; Allt-y-Graban Road ready to be put up. Previously on Monday we'd travelled up to Worcestershire to collect the very last of the baseboards from Chris Yates' workshop. This is the board known as "the Trouser Board" as it has two legs at one end, one for the mainline, the other for the branch. It's an awkward shape too difficult to fit in an estate car or people carrier and so we had to get a van. Here it is back at the clubrooms ready for a sealing coat of varnish. More preparations with the Open Day ever closer. The trackthreading has now moved on to the curved sections which require the gauge-widened bases. We are also pre-curving the rail to get a good shape. These are harder to do than the straight track so this section and one more were completed tonight. Wagonman continues with the meatvan from last week. The peculiar angle of the van allows the vacuum pipe to stay in the right place while the glue sets. And he's also working on this 4 wheeler from a Slaters kit. For Cwmdu here's a bit of fencing I prepared, adding bits of rail on the back for support. The end panel is intentionally stepped as there is a change in ground level. Further work on the extra scenery started last week, but with more grass to add. In preparation for the upcoming, and now very close, Open Day, work moves on apace on Cwmdu. Mike has added these extra contours to the more scenic end board . . .
. . . and electronic controls underneath for the point servos. This was not without its problems - don't you just love computers. And Little Mill will be on display for the Open Day. 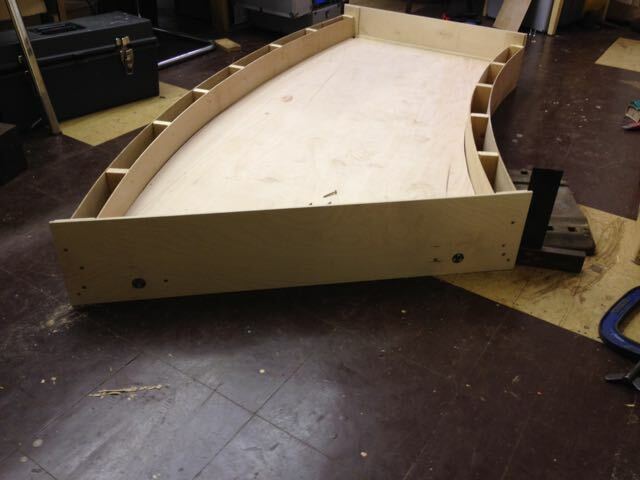 We'll have all of the boards, less the three final curved sections. While we won't have much track laid we do have enough for the whole of the main line prepared, as seen below. Thanks to Mike G and a few other willing hands for getting this done. Work on the bionic finger replacement in progress. Wagonman has been at it again. This time its a Southern meat van. A Friday with plenty going on. Following the Monmouth Show Pavilion End returned to the club with a list of jobs and suggestions for improvement. A bit of tidy up of the wiring, then sorting out some unstuck cassettes. 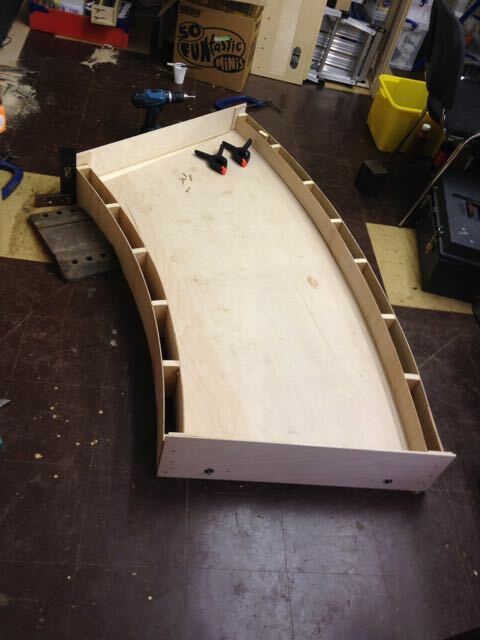 P4 track for LMJ is required in quantity and Mike has been pressing on with threading the bases onto the rail. More work on the permanent way happened on Cwmdu so both turnouts are now working. On LMJ itself work has resumed on the scenic side with lots of plastering with bandages to form the surface over the foam underneath. A recently arrived baseboard for LMJ had a sealing coat of varnish at the end of the evening allowing it to dry over the weekend. 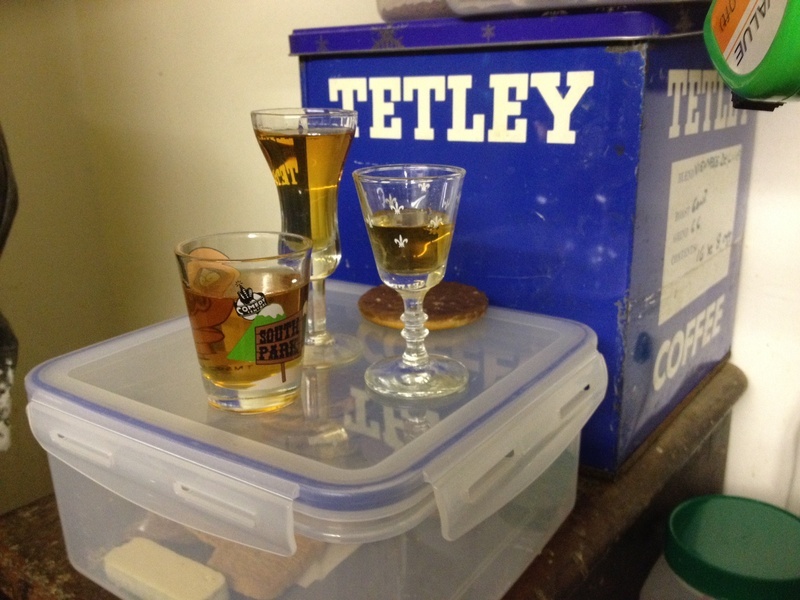 And through the evening Rob worked on some compensation units for wagons and kept up the supply of tea. Sunday saw a number of club members enjoying the day operating Pavilion End at Rotary Club of Monmouth Model Railway Exhibition. Glad I went to the Model Railway club instead of watching. Friday featured a return by Mike G after a period with back problems. As a fellow sufferer, though not as badly, he has my sympathy. He brought along a few items recently on the workbench. First up these wagons. The opens are Parkside kits with Craig Welsh underframes and detailing. The underframe detail is very fine as I hope you can see and there is also the capping strips on the top of the bodies. The van has been updated with Rumney Models underframe, again a very well detailed kit now waiting for just the vacuum cylinders to complete. And of course Rumney Models is in fact our club member Justin. Work has progress on the County, though there is little of the original Jidenco kit in it, Mike having added his own parts. .As well, Rob Foot offered this Heljan Class 14 with Ultrascale wheelsets, though it was not without problems. UPDATE Rob says the beast now runs very smoothly. Well, apologies for the lack of update but I wasn't present last Friday to witness any progress. However, someone was there as a light had been left on so I responded to the phone call from the caretaker. Not a problem, it's not far to the clubrooms, except I chose to go mid Saturday afternoon when the local bagpipe band were having their practice session! So that was a quick visit. 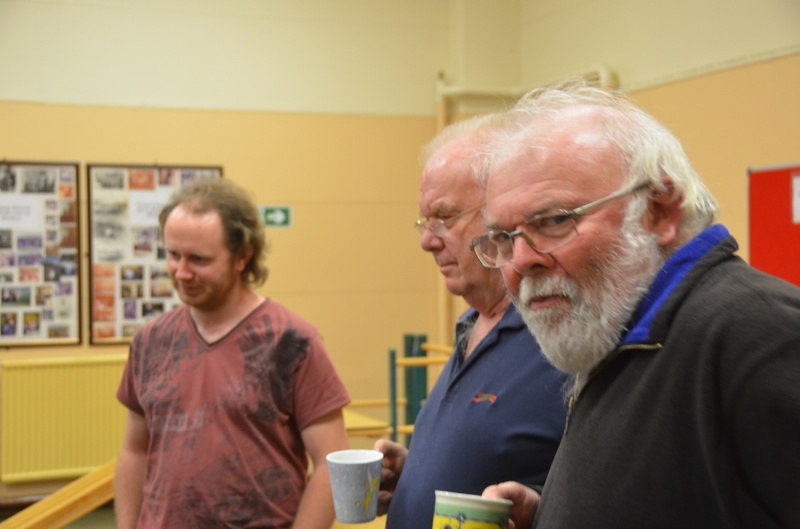 But it's gets worse as the band have now started an extra session, and its Tuesday evening, one of our club nights. Mike Edmunds was busy adding extra layers of colour to the bridge from Cwmdu. 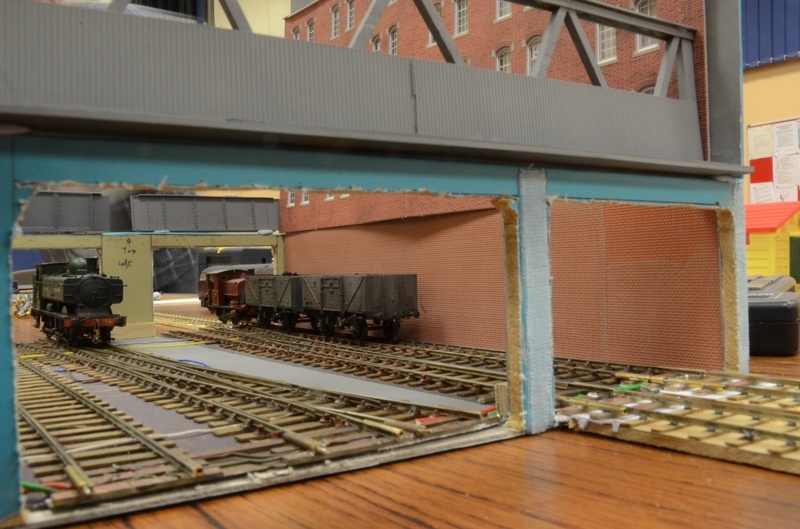 And with the end baseboard for LMJ, LBH earlier manufactured some L-girders. Now we've fitted them to provide a bit of strength and rigidity. We'll test it when the glue has set. The cross-piece is just placed there at the moment. We hope it won't be needed. Apologies for slow update but there've been software problems again. So the highlight of last week was the club Christmas Party and P4A4 'presentation'. Unfortunately the originator of the challenge, Steve or XYS, was unavailable due to work commitments so who knows what rules were flouted. So we had three entries. There will be/are more photos on the P4 in A4 page. Rob's opus has the provisional title Brians Brewery. For this, the box is used as the container only. Lessons learned from IKEA to get it all in here. It joins up in the flat. And using DCC you can get 2 locos moving. Its definitely a lot of layout to come out of that box. But if you look at the horizontals you'll see what I mean about IKEA. 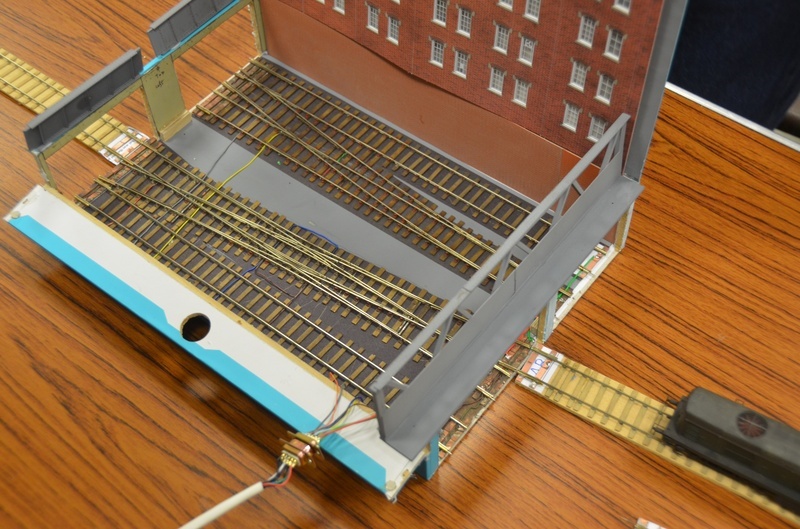 I presented a box containing a layout called Terminus. Its not all my work as I've utilised track made by Tony Bennett for the original Belle Vue, but it was never used as we had a change of plan. A fact which Tony grumbled about from time to time. The idea was to get a lot of track into a small space. And yes, the loco did take the curved road through the double slip. LBH took lots of pics, though I wasn't expecting any to be taken from this angle. 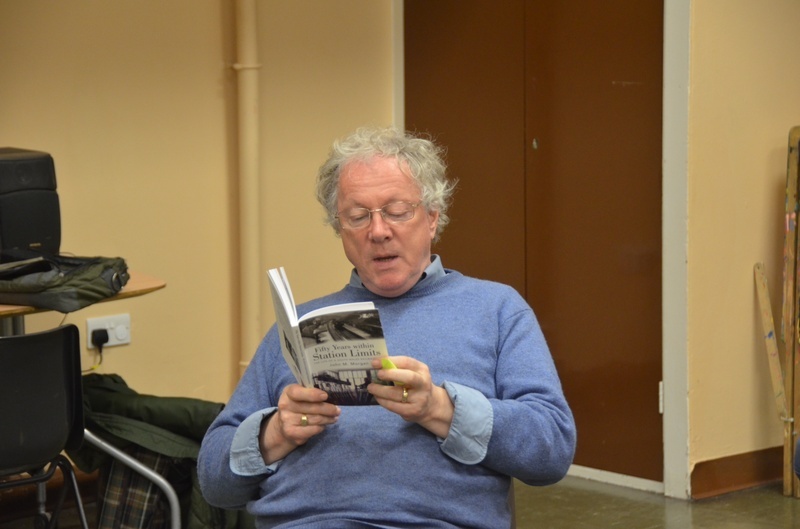 Mike Edmunds regaled us with some amusing engineman's tales. With a nod to Dylan Thomas, Steffan brought us Pont Llados. The box is on its side and contains the scenic section and all the extras for the wings. It spreads over two tables! Scenically it is heavily influenced by the Wye Valley line. We had a good attendance with the usual ribaldry, not to mention food - pate, rolls, rock cakes, cheese, biscuits, red wine, cream cakes, Scotch eggs, tea, satsumas and of course mince pies. Moving on to Friday, LBH and myself were in attendance. We also had a look at what to do next with the baseboard. 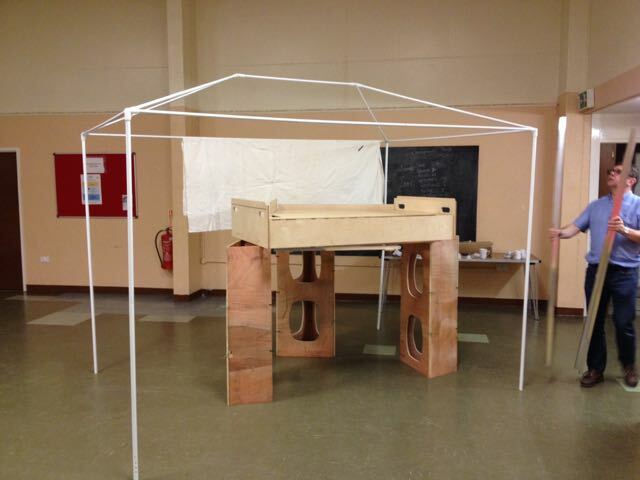 It needs stiffening so the thought is L girders arranged something like this. Then some cross-members which will further stiffen and allow attachment of the trackbed. Happy New Year, Blwyddyn Newydd Dda to all (or both) our readers. Mr Chairman and LBH continued with the curve baseboards at the Newport end of LMJ. Here is progress to date. The two curved beams have now been fixed to the end boards and the glue left to cure. 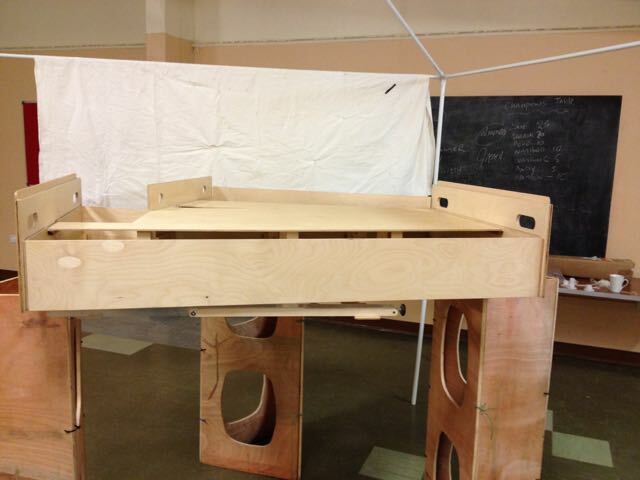 We'll see on Tuesday how rigid the assembly is before deciding on exactly how to move forward.